Happy 2019, folks! It’s been a busy 2018 since my last update, full of exciting new adventures. 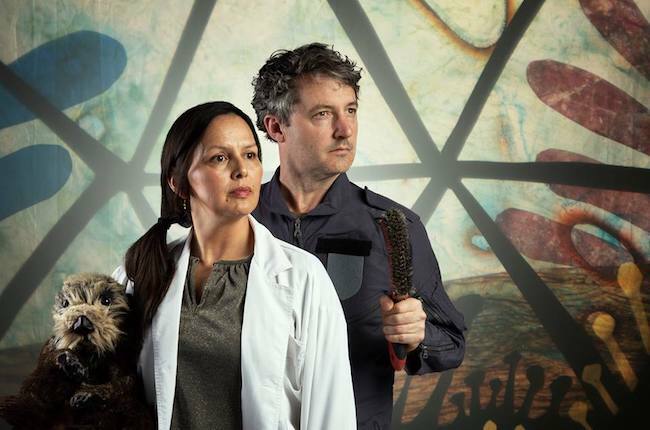 First and foremost, A Brief History of Human Extinction premiered at the Cultch! The conclusion of the two-year collaboration between the puppeteers of Mind of a Snail and myself was a trippy, lyrical production that Kathleen Oliver praised for “abundant wit and visual pleasure,” noting that “the planet’s doom can be a boon to creativity.” Huge thanks are due to Up in the Air Theatre and the Cultch for supporting the collaboration, Mind of a Snail, and all our co-collaborators—perhaps especially Stephanie Elgersma for her sublime creation of Ommie the Otter, who has been haunting my dreams lo this many a year. In the meantime, I’ve taken on my first University teaching post: I’m officially the first year screenwriting Instructor for Capilano University’s School of Motion Picture Arts. I had a terrific time with my first crop of young filmmakers in the fall, and I’m looking forward to doing it all over again come September! In other news: Kayak saw production in Detroit last April (and even scored a mention in Broadway World…), and will be going up again in Chicago this March. Not only that, Kayak received a nomination for the Surefire List—PGC’s first shot at a Canadian version of the Kilroys—and while it didn’t make the list proper, it was honour to be nominated alongside so many terrific lady playwrights. Rube Goldberg for the Generation of Hope was performed again at the New York Sustainability Summit, and published in the 2017 CCTA Anthology. The CCTA anthology is now available in print through the York University Bookstore. For those of you affiliated with universities, I hope you’ll encourage your institutions to get a few copies! I had the pleasure of attending EMOS in Anchorage this year as part of the collection’s launch—you can read a distillation of my paper on Climate Change and Narrative Conventions here on the Artists and Climate Change Blog. Finally, I’m happy to announce that I’ll be collaborating with the Only Animal on Send Word in the Summer of 2019, and that I’ll be developing The Cupertino Effect with support from the BCAC. Now back to the laptop I go! all content copyright of Jordan Hall (c) 2018.